A 2 dram* (1/4oz) glass dropper bottle of Matrixyl® Synthe'6®. *You may choose a larger size. "Mirror mirror on the wall ... How long will I be the fairest of all?" No magic mirror needed. Looking for a powerful anti-wrinkle peptide acting on 6 skin-rebuilding essentials and tested with success on the forehead? Stop here and discover Matrixyl® synthe’6®! Blur your crow's feet permanantely. You can not find this formulation stronger anywhere. Do you want 1% or do you want 35%? Silly question, we know! 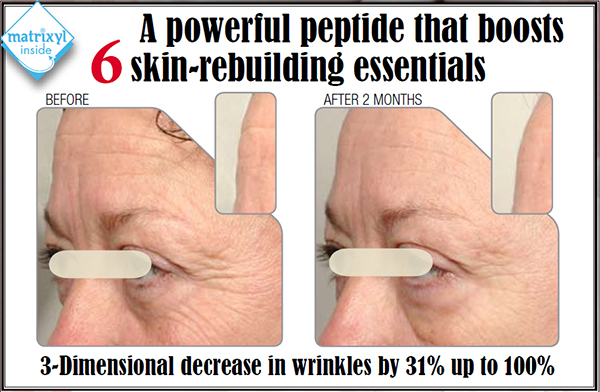 Now learn what this active can do for your lines, and get started with your antiaging program now. Fill in your wrinkles from the inside. Shorten and smooth the lines after 60 days (2% **Ours is 35%). Stimulate collagen I, III and IV. Stimulate hyaluroinc acid production for more hydration deep in the skin. Twenty-five female volunteers aged 42-70 years old with forehead lines applied a 2x daily application of cream containing 2% Matrixyl® Synthe'6® for 2 months vs a placebo cream. After 2 months the forehead and crows feet wrinkles are evened out just like a facelift. Can you imagine how wonderful YOUR skin is going to look after using this super strong formula created specially for Platinum Skin Care? What can you expect on your forehead after 2 months? Twenty-five female volunteers aged 42-70 years old had the following results using only a 2% formulation! What can you expect on your crows feet after 2 months? Synthe'6® fills in wrinkles from the inside both on the forehead and the crow's feet for a visibly smoother and plumper skin. Thanks to its matrikine–like effect, Matrixyl® synthe’6® stimulates 6 major constituents of the skin matrix and the dermal-epidermal junction (DEJ) and ensures an optimal architecture of the tissue. In vivo studies demonstrated that, after 2 months, the forehead and crow’s feet wrinkles are visibly smoothed from the inside of the skin. Many parameters demonstrated this smoothing effect (wrinkle volume, depth, surface...) and more particularly the lifting effect and the wrinkle spread. Definition: A dioxygenated lipopeptide Palmitoyl‑Lysyl‑Dioxymethionyl‑Lysine. Properties: Evens out skin relief and smoothes wrinkles from the inside by rebuilding the skin where it is needed, particularly on the forehead and crow's feet. Characteristics: Matrikine-like effect that stimulates the synthesis of 6 major constituents of the skin matrix and dermal-epidermal junction (collagen I, III, IV, fibronectin, hyaluronic acid and laminin 5). 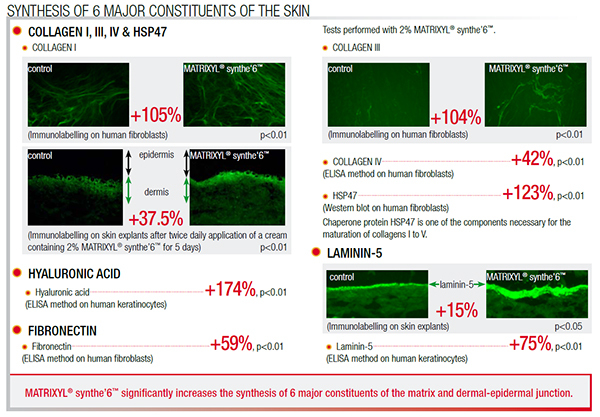 Points of interest: MATRIXYL® synthe’6™ is derived from the tripeptide KMK naturally found in collagen VI and laminins. Applications: Skincare and make-up designed to fight wrinkles. That's it. Head back to the top of the page so you can put it in your shopping bag.